Congratulations on upgrading your Custom Church App with live streaming! This upgrade provides a cost-effective solution for broadcasting your services to users of your mobile app. For a full-fledged live streaming solution that may also be used with your web site, please visit http://www.worshipstream.com for information about available subscription packages. For an overview of how streaming works, please visit http://www.worshipstream.com/pages/product-tour/live-webcasting/. Setup your streaming encoder software. Setup your mobile app to view live streaming. You can get Adobe Media Live Encoder from Adobe’s web site at http://www.adobe.com/products/media-encoder.html. If you have the option to check the “Deinterlace” box in the bottom left, do so. Once this is done, you should be ready to stream! Simply click the Connect button on the right hand side, and then click the Start button at the bottom. It can take about 30-45 seconds for the stream to appear in your app. Select Output Settings from the Output menu at the top. Width and Height will be based on what your video set up is. We would recommend using something between 640 X 480 and 1280 X 720. Click the Encoding drop-down menu right above the Address box and select the new preset you just created (WorshipStream 1). It will probably be at the top of the options. At this point you should be ready to stream! Simply click the Stream button at the top left of the program to start streaming. It may take 30-45 seconds for the stream to appear in your app. 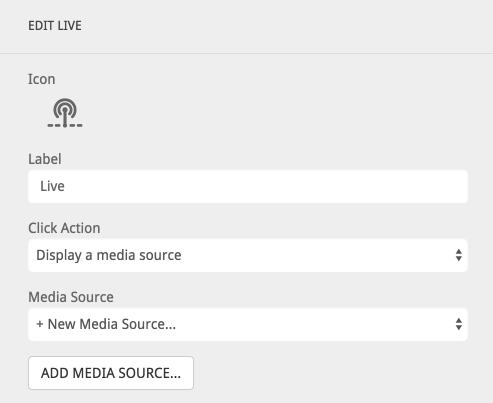 You can configure your live stream upgrade on any button or tab. In this example we will add a new home screen button for this. 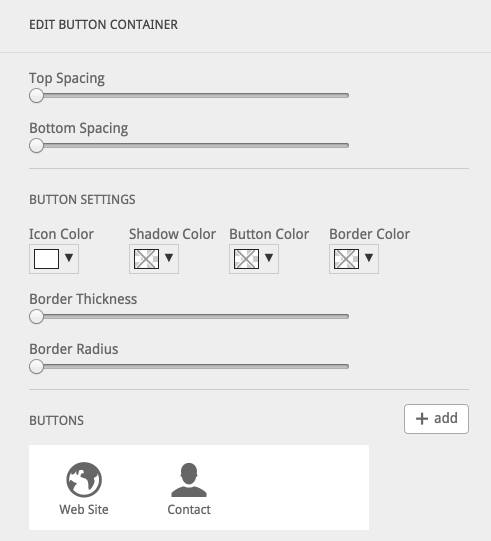 On the Home Screen section, find the Button Container component and click it to open its properties. To add a new button, click the “+ add” button. You will see an editor like the one below. Edit your button’s icon and Label however you wish. Under the Click Action selector, choose “Display a media source”. Under Media Source, select “+ New Media Source”. Click the “Add Media Source” button. You’ll be presented with a set of media sources to choose from. Select the “Live Stream” item. You’ll see an editor like the one below. Edit the Title of your stream. This is only for your own reference. 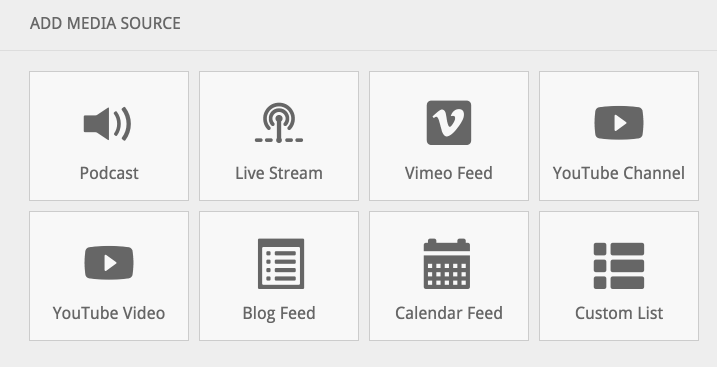 Under the WorshipStream banner, check the “Use your Live Stream Upgrade from WorshipStream” checkbox. Some of the options in this screen will disappear since they are configured automatically at this point. Click the “Done” button at the bottom to exit each editing page and return to the Home Screen section. Click the yellow “Save Changes” button in the upper right area of the console. Click the green “Go Live” button in the upper right area when you are ready for your changes to show up in the app. 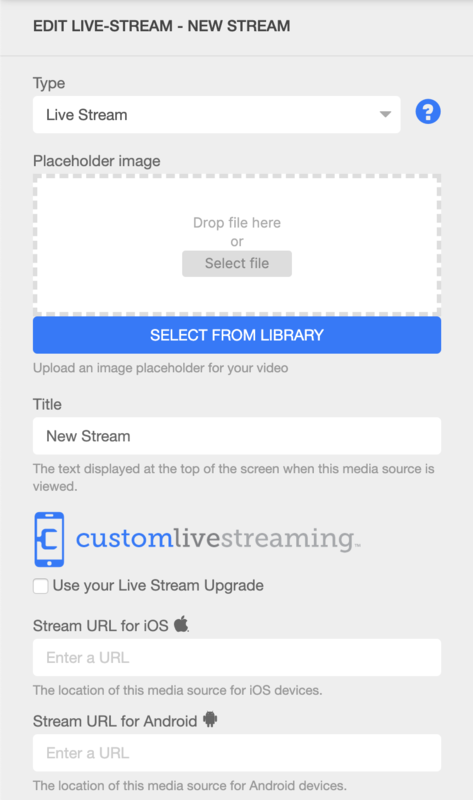 Now try using your stream encoder software to start a live stream, and then try out the new button in your mobile app. Why should I have Live Streaming?